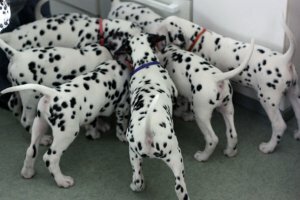 We have for sale just one 4 boys and 3 girls gorgeous dalmatian puppies for sale and ready to move into their new homes. These pups will be leave registered, Baer tested, and come with full advice and a puppy pack. All pups are raised in our home and can be viewed at any time. They have been well socialized, used to children and general family chaos. Puppies have been weaned on royal canin n solid food, wormed since birth, flead, already had their first vaccination and have been thoroughly vet checked. Each puppy will also come with a 5th gen pedigree as well as a vet certification. For more details, please email or call.